In a fitting farewell to one of the most magical film series in Hollywood history, Warner Bros.’ Harry Potter and the Deathly Hallows Part 2 is the first film in the franchise to reach the $1 billion mark worldwide. Deathly Hallows 2 will cross the milestone on Saturday, having grossed $296 million domestically and $630 million overseas through Thursday for a global total of $926 million. Another blockbuster weekend at the multiplex is forecast, allowing the film to easily pass the vaunted $1 billion mark. The movie, benefiting from being released in 3D, is racing past the milestone in about two weeks, a remarkable achievement. Until now, Harry Potter and the Sorcerer’s Stone (Harry Potter and the Philosopher’s Stone overseas) was the top grossing pic in the franchise, having grossed $974.8 million globally in 2001-02. The Harry Potter franchise has always been immensely successful internationally, with every title in the series earning substantially more offshore. So far, 68 percent of Deathly Hallows Part 2’s gross has been earned at the international box office, fueled by standout performances in the U.K., Japan, Australia and Germany. By the end of this weekend, Deathly Hallows Part 2 should surpass Sorcerer’s Stone‘s domestic gross of $317 million, the best in the series. It also will have surpassed the $659 million earned last year internationally by Deathly Hallows Part 1. 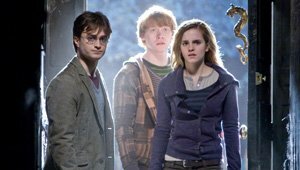 Deathly Hallows Part 2 becomes the 9th movie in history to gross north of $1 billion worldwide, a club that includes Warners’ The Dark Knight ($1 billion), Disney’s Alice in Wonderland ($1.02 billion) and Disney’s 2011 summer tentpole Pirates of the Caribbean: On Stranger Tides ($1.03 billion). Only one film has ever grossed north of $2 billion, and that’s James Cameron’s Avatar ($2.8 billion). LOS ANGELES – Prosecutors charged Lindsay Lohan Wednesday with felony grand theft of a $2,500 necklace — a case that could return the troubled starlet to jail rather than the big screen. The “Mean Girls” star was due to be arraigned later in the day. Her lawyer, Shawn Chapman Holley, has denied the allegation. Prosecutors want Superior Court Judge Keith Schwartz to set bail at $20,000, according to the complaint. If convicted, Lohan could face up to three years in state prison. The charge was the latest — and most serious — legal problem for the actress, who remains on probation in a 2007 drunken driving case. Police and prosecutors claim Lohan, 24, took the necklace from a store in the beachside community of Venice on Jan. 22, weeks after she was released from a rehab facility where she was accused of misconduct. The former Disney star has struggled with the terms of her probation, and was sentenced to rehab twice and jail twice last year. Judge Schwartz will determine if Lohan violated the terms of her probation, which required her to obey all laws and submit to random drug and alcohol testing. The jewelry case is not Lohan’s only concern. Prosecutors in Riverside County are considering whether to charge the actress with battery for an altercation with a rehab worker at the Betty Ford Center in December. The worker was fired after giving an on-camera interview to celebrity website TMZ, but district attorney’s spokesman John Hall has said the allegation against Lohan was under review. The threat of incarceration has hung over Lohan since May, when a judge handling her DUI case determined she violated her probation by missing weekly alcohol education classes. Her three stints in jail in the past three years have all been shortened by overcrowding and the fact that she could not be held without bail on a misdemeanor.